In tandem to Gerry Hemingway’s six day residency at the Stone between July 28th and August 2nd, WKCR presents a profile of his over 40 year musical career in a program that will feature Mr. Hemingway himself, along with rare and unreleased recordings from his personal archive. 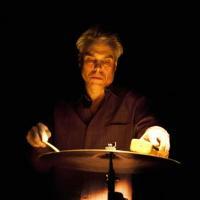 Gerry Hemingway is a drummer, composer, bandleader originally from New Haven, Connecticut, and between the late 1970’s and 2009 resided in or near New York City. Since 2009, Mr. Hemingway resides in Lucerne, Switzerland. He is featured on over 150 recordings, many under his own name that span from solo, small group, large ensemble, chamber music to orchestral music. He is well known for his eleven-year tenure with the Anthony Braxton Quartet between 1983 and 1994, as well as long musical associations with legendary bassist Reggie Workman, multi-instrumentalist Wadada Leo Smith, and pianist and composer Anthony Davis. Some of the central projects of his career are the collective groups including BassDrumBone with trombonist Ray Anderson and bassist Mark Helias, which is currently celebrating it’s 38th year, the WHO trio, based in Switzerland, with pianist Michel Wintsch and bassist Baenz Oester and now in its 18th year, as well as the trio with German pianist, Georg Graewe, and Dutch cellist, Ernst Reijseger, which celebrated it’s 25th anniversary last year. However, the central projects of his vast musical discography are his own quintets, which began in 1985 with many recordings for Hat Art, Random Acoustics and GM recordings, as well as his quartets, which began in 1998 (recording for Clean Feed records), his solo work (with five releases to date), which began in 1974 and now includes his visual art as a part of it’s presentation, and his work as a songwriter and interpreter of song repertoire. On July 26 between 2 and 4 pm, Mr. Hemingway will present a brief chronological overview of his work between 1972 and now, and then between 4 and 7pm the remainder of the profile will concentrate on projects that are a part of his residency at the Stone between July 28 and August 2, which in itself spans many of the central aspects his long illustrious career as a performer, improvisor, interpreter and composer of a remarkably diverse array of music.